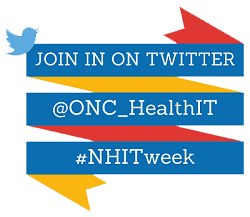 Welcome to National Health IT Week 2016! This annual celebration is a time for all of us to reflect on the progress we have made and recommit ourselves to advancing the promise of health information technology. We are looking forward to a busy week where we’ll be highlighting that progress, as well as unveiling some new health IT tools and resources. Please check back on this site because more activities and information will be posted as they become available. Read the full message from President Obama. ONC released a comprehensive Health IT Playbook with links and tools to help providers use their health IT. As part of the Playbook, ONC also posted a new EHR contract guide, EHR Contracts Untangled: Selecting Wisely, Negotiating Terms, and Understanding the Fine Print, which offers strategies to help providers as they compare EHRs and negotiate key terms with EHR vendors. We hosted a public webinar on Friday, September 30 to help you better navigate these two resources that could help any practice. See below for details! In early September, we announced the winners of the ONC “Use of Blockchain in Health IT and Health-related Research” Challenge, where we solicited white papers on the topic of Blockchain technology and the potential use in health IT. Some of those winners presented their work at the National Institute of Standards and Technology (NIST) during a joint ONC/NIST workshop. You can read all of the Blockchain Challenge submissions on HealthIT.gov. This summer, ONC released new survey data shows nearly all of the nation’s hospitals have adopted certified electronic health records. This represents a nine-fold increase since 2008 and also shows that there has been an increase in the sharing of health data among hospitals. Read the ONC Data Brief. HHS and ONC released a new whiteboard video highlighting how health IT is foundational to help reform our health care delivery system. During National Health IT Week it is important to remember that we all are working to unlock health care data and put it to work when and where doctors, individuals, and hospitals need it. Read more in this blog post from Dr. Washington and watch the video now. Dr. Vindell Washington, National Coordinator for Health IT, held a Twitter chat using #AskVindell. We discussed the current state of health IT, where we’re going from here, and answered your questions. Many of us now use wearables and other types of health information technology to help us manage our health and the health of our loved ones. These fitness trackers, their related social media sites, and other technologies are changing the way we interact and control our own health. However, they did not exist when Congress originally enacted the Health Insurance Portability and Accountability Act (HIPAA) in 1996. Along with our colleagues at the Office for Civil Rights (OCR) and the Federal Trade Commission (FTC), we released a report that discusses the lack of clear guidance around consumer access to, and privacy and security of, health information collected, shared, and used by entities that are not currently covered by HIPAA. You can also check out our blog post explaining the report and why it’s important for you to know about these gaps. Your Health Information, Your Rights. HIPAA gives individuals the right to see and get copies of their health information, or share it with a third party, like a family member or a mobile device application. Having easy access to their health information empowers individuals to be more in control of decisions regarding their health and well-being. Individuals can monitor chronic conditions better, understand and stay on track with treatment plans, find and fix errors, and contribute information to research if they choose. To help explain this important right to individuals and health care providers, ONC and OCR have developed easy-to-understand educational tools in English and Spanish. Watch at HealthIT.gov/access and help us spread the word! We recognize that conducting a risk assessment can be a challenging task. That’s why ONC, in collaboration with OCR and the HHS Office of the General Counsel (OGC), developed a downloadable SRA Tool to help guide you through the process. This tool is not required by the HIPAA Security Rule, but is meant to assist providers and professionals as they perform a risk assessment. Download the revised SRA Tool and User Guide. ONC announced seven recipients of the High Impact Pilot (HIP) and Standards Exploration Award (SEA) Cooperative Agreement programs. These programs are designed to improve the flow of health information to make sure it is available where and when it is needed for health and care. The HIP and SEA programs provide a total of $1.5 million to support pilot projects from around the country to create a technology and standards-based solution to address a variety of challenges that slow the exchange of health information. Read more for the list of awardees and their projects. In August 2016, ONC published the draft 2017 Interoperability Standards Advisory (ISA), a coordinated catalog of standards and implementation specifications available for use by the health IT industry to meet interoperability needs. Public comments will be accepted until 5 p.m. ET on Monday, October 24, 2016. View and comment on the new online version of the ISA. These comments will be used to inform the final 2017 ISA that will be released later this year. The Interoperability Proving Ground (IPG) was launched earlier this year and has been met with much enthusiasm. Since its go-live, the IPG has grown from 30 active projects across the country to more than 200. More features have been added during the last couple of months, including subscription services, tagging, and an improved map. If you have questions or would like to learn more about the IPG you can email ONC.techlab@hhs.gov. Visit the IPG today! ONC’s Health IT Certification Program published a Health IT Certification Program Overview in the recently released Health IT Playbook. The overview explains ONC’s role and the roles and responsibilities of participants and those seeking certification. This overview reflects the program’s ongoing commitment to working transparently and ensuring that stakeholders fully understand the structure of the program. We held a Twitter chat to discuss the Model Privacy Notice (MPN) using #MPNchat. Similar to the Nutritional Facts label, the MPN is being designed to provide a snapshot of a company’s existing privacy and security practices to help consumers make informed choices when selecting products that collect digital health information. ONC’s SAFER Guides have been incorporated into the newly-released Health IT Playbook. The Playbook is a tool to help providers get the most out of their health IT. The SAFER Guides enable healthcare organizations to address EHR safety in a variety of areas and recommended practices to optimize the safety and safe use of EHRs. View the SAFER Guides in the Health IT Playbook. Earlier this summer, ONC published two reports on health IT safety: Report of the Evidence on Health IT Safety and Interventions and Goals and Priorities for Health Care Organizations to Improve Safety Using Health IT. The two reports show that health IT safety is dependent on a number of factors and that usability and interoperability also help improve health IT safety. Read more about health IT safety and these two reports. HHS announced the winners of the HHS "A Bill You Can Understand" challenge, a design and innovation challenge to solicit new approaches and draw national attention to a common complaint with the health care system: that medical billing is a source of confusion for patients and families. See who won the challenge. On Monday, we announced the launch of the Health IT Playbook, a tool to help make using health information technology (health IT) easier for providers so they can get the most out of their technology investment. On Friday, we hosted a public webinar to demo the Health IT Playbook. The Health Affairs Blog features a new post by National Coordinator for Health IT, Dr. Vindell Washington, and former National Coordinator, Dr. Karen DeSalvo. The post discusses the progress the nation has made since the Health Information Technology for Economic and Clinical Health (HITECH) Act was signed into law in 2009. Further, it highlights how the transformation from paper to electronic health information is foundational to an era of health where information is seamlessly and security available where and when it is needed most. Read the blog post. 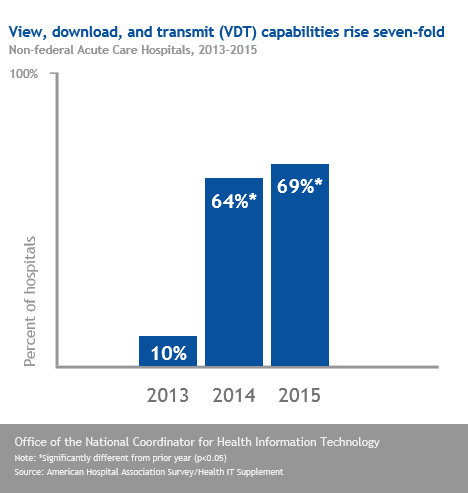 Earlier this month, ONC released the data brief, Electronic Capabilities for Patient Engagement among U.S. Non-Federal Acute Care Hospitals: 2012-2015, which highlights the significant increase of patient engagement functionalities since 2012. Since 2013, there has been a nearly 7-fold increase in the percent of hospitals that provide patients the ability to electronically view, download, and transmit their health information. In 2015, 69% of all US non-federal acute care hospitals provided patients these capabilities, a statistically significant increase. Providing patients with the ability to engage with their health care provider electronically can lead to better communication, care, and outcomes for patients as well as lower costs. Read more on the ONC Buzz Blog. The Office for Civil Rights has released a new FAQ addressing whether a business associate of a Health Insurance Portability and Accountability Act (HIPAA) covered entity may block or terminate access by the covered entity to the protected health information maintained by the business associate for or on behalf of the covered entity. This clarifies that business associates may not use such information in a manner or to accomplish a purpose or a result that would violate the HIPAA Rules. Read the new FAQ. “Purchasing processes and contracts have an important role in ensuring information can move freely and securely across all the devices and IT systems used in patient care. This guide can help foster the dialogue between buyers and sellers to achieve that shared goal,” said Ed Cantwell, Executive Director, Center for Medical Interoperability, regarding the EHR contract guide. “The American College of Surgeons thanks ONC for the work they have done on the Health IT Playbook, which will be an exceptional resource for surgeons who participate in all the various federal programs. It is a superb navigational tool for assisting surgeons in the emerging MIPS and APM world and it assembles the work across all the federal healthcare agencies into one workable website,” said Frank G Opelka, MD FACS, Medical Director, Quality and Health Policy, American College of Surgeons (ACS). "It is great to see ONC stepping up and creating the Health IT Playbook. They have engaged family physicians to offer input during the development and we are excited to see it has launched. Physicians can find it difficult to keep up to date on the changing requirements for and breadth of information on health IT. The simple structure and the interactive tools provided in the Playbook will be an asset to family physicians and their practices as they continue their journey of selecting, implementing, optimizing, and switching EHRs. This will be a great addition to the resources the AAFP provides its members,” said Dr. Steven Waldren, Director of the American Academy of Family Physicians’ (AAFP) Alliance for eHealth Innovation.